The first step towards any winning campaign is to define what victory looks like and to boldly dream of what does not exist—yet. The earliest days of Climate Justice Alliance (CJA) held the seeds of our ancestors’ dreams and have grown into our collective hopes for a more just tomorrow. But to continue this critical work we must ONLY be beholden to frontline communities and our movements. Will you help us achieve this dream by becoming a monthly sustainer of our work? Our goal during our end-of-the-year giving campaign is to gain 1,000 new monthly sustainers! For as little at $10 a month, or any amount that is meaningful, you will be pushing us closer to achieving this. This strategic manifestation of dreaming big is evident in CJA’s Our Power Communities. The goal of CJA’s Our Power Communities (OPCs) is to transform extractive economic systems into thriving, regenerative communities and regions. OPCs in California, Arizona, Mississippi, Michigan, Kentucky, and Texas are writing the story of what Just Transition looks like today and creating space to dream even bigger for the future. By intentionally bringing together formerly siloed sectors of the Environmental Justice movement, OPCs are showing us what building sustainable power looks like in practice while centering communities of color leadership in both the problem analysis and strategic solutions. This expansion of what is possible is inspiring and critical movement building work. 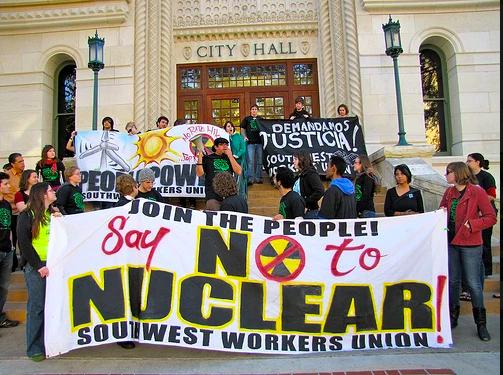 One member of CJA’s Our Power Campaign is Southwest Workers Union (SWU). SWU, located in San Antonio, Texas, is a founding member of CJA and an active Our Power Community since 2014. SWU’s success over the past thirty years is a direct result of practicing deep and authentic grassroots organizing. SWU strategically organizes at the intersections of multiple environmental justice issues. By recognizing how the over criminalization of communities of color, militarization, and immigrant worker fights for living wages connects to a broader environmental justice vision, SWU organizes victories through their civic engagement and voter registration focus, environmental justice, and worker rights campaigns. For more than three decades, SWU has been critical in organizing the new movement we are witnessing in Texas today! They are currently working on climate action and sustainability plans with the city and play a crucial role in fighting back against anti-immigrant sentiment. You can support the work of SWU now at this important moment in history for our people and movements! SWU also recognizes that making space for queer, trans, and women of color leadership is an opportunity to change the culture of organizing in south Texas. This intentional cultural transition has led to deeper organizing around women-led economies. By ensuring that young people and women have the support and space to be seen and to lead has impacted how SWU approaches organizing. It brings fresh perspectives to SWU’s evolving and strategic vision of change. Anchored by the wisdom of their 2,300 members, with majority being women, SWU is able to directly address the lived and historical disparities in health, wealth, education, and political power in South Texas. Your support to Southwest Workers Union empowers its members to build multi-generational power and win substantive change. SWU joined the OPC family sharing their victories of building the new (e.g. establishing a local utility ratepayers union) and learning from the collective struggle to defeat industrial projects that would further pollute low-income residential neighborhoods. SWU, along with other OPCs, knows that building a strong base takes time, trust, and an unwavering commitment to the long-term righteous work towards justice. This truth was illustrated at SWU’s recent Building Bridges: 30 Years of Change celebration. Hosted right after the midterm elections, SWU organized three days of skill sharing and a membership assembly to inform SWU’s priorities beyond 2020. 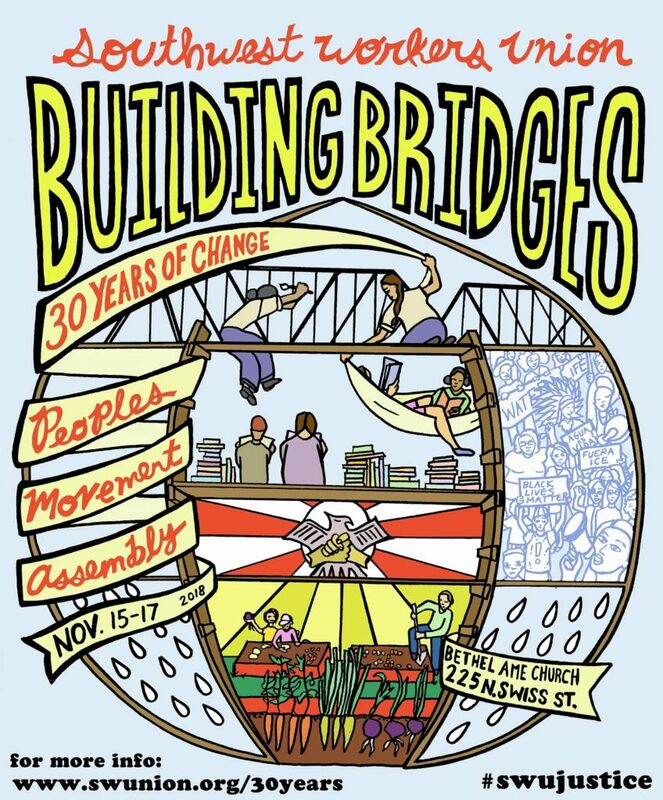 Building Bridges was designed as a people’s movement assembly. They held 12 different spaces for people to learn new skills like accessing mobile integrated voter engagement strategies, power mapping, reconnecting to water, and rethinking the way work is structured beyond 9 to 5. SWU has been a critical force in a variety of struggles at the local level like upholding domestic workers’ rights, engaging the city to push forward sustainability plans and climate action, and community reinvestment strategies. The anniversary was a beautiful moment to acknowledge all that has been accomplished over SWU’s long history, while planning with community and allies next steps for the work ahead. They took time to reflect on recent victories such as the defeat of the “show me your papers” policy, the strengthening of workers’ rights in San Antonio through the Paid Sick Time Coalition, and stopping the outsourcing of school workers. Building Bridges ended with a joyous community-building party. SWU’s growing and active base is the result of spending time talking to working-class San Antonians and listening to the issues that are important to them. Another critical reason for SWU’s capacity to influence change is that they own—and generously share—their space with other justice movements who are connected to their membership leaders. Having a physical space for this kind of leadership development reinforces why coming together to learn, strategize, dream, heal, and celebrate is a requirement to sustain movement building for the long haul. When you donate to SWU you are part of this long-term and visionary movement building. It’s a process to shift the dominant extractive culture towards a culture that practices Just Transition principles. By doing the hard work of creating the new, SWU and other OPCs don’t have to contort themselves into existing structures that have historically excluded communities of color and low income people. With the coordinated support of the Climate Justice Alliance, OPCs are fusing belief with action, while taking time to celebrate all the victories—big and small. This is the work that sustains a future that looks like the aspirations of our ancestors. Our collective dream of healthy communities, a healed planet, and preservation of our cultures is our reality to make. Contribute to SWU today or become a monthly supporter to CJA to build a thriving and empowered climate justice movement.